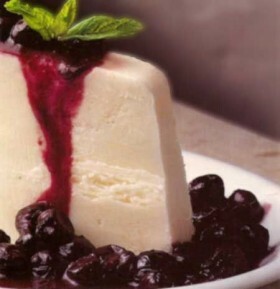 I love Lemons in the summer and with the blueberries this makes a stunning pudding, it also means that it sits in your freezer so you can make it weeks before and just make the bluberry part on the day you want to serve it. The blueberries are heated in gin but do not worry if you hate gin just do not put it in, it only gives it a slightly more adult flavour. When you want to use it take out of freezer and sit in the fridge for about 40 mins and it will slice well.